I photographed this car last year. I loved the Lafayette sign above it. I’m pretty sure the car has not moved since last year. It was very dirty and seemed to be in the very spot I found it previously. I was not going to photograph it again and then, like I spoke about in a previous post, I thought, what can I do differently. I moved across the street and this time and included the woman. Last year, when photographing cars, I was all about clean scenes without people. This is something I’m prone to do. My comfort zone is clean images without people. Add to this, my negative self talk which has been, I’m not a “people photographer.” As such, I’ve never been comfortable photographing people. I envy those who are. We had a few on this trip who I’ve learned from. While this is not really a “people picture” adding the human form is new for me and I’m very happy with it. I think it adds to the image. How about you? Do you stay in your comfort zone? Is it hard to try new things? What did you do to beat that demon? Very good. I think the lady adds to the shot. I am not good at people photography either, so I do understand how you feel. BTW, I am learning from you just looking at your posts. Thank you. Me too… not comfortable with people photography… my area of discomfort with it is asking people (strangers) if it is OK to take their picture and feeling as though “posed” images aren’t as good as candid shots. And candid shots don’t always work out to a person’s advantage. 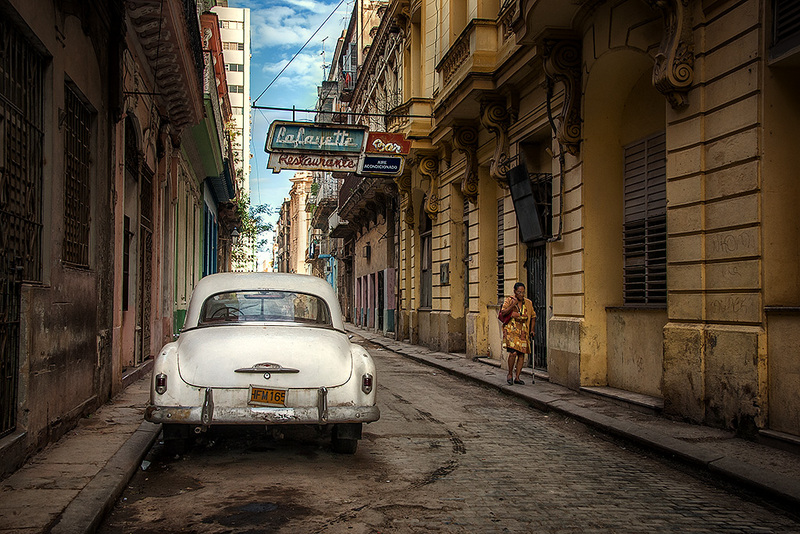 I really like this image and am stretching to not be so bothered myself by images with people in them… especially since our adventures in Cuba almost always resulted in images with people somewhere in the shot! Love this…so many times the human element adds so much! I definitely agree with you about including people in shots. I was at the Art Institute of Chicago recently viewing one of the photography galleries. I had my camera with me and I saw a shot that I really liked of a handful of people standing in front of a wall of photographs. I didn’t take the shot, however and I wish I had. I like this shot of the car and the inclusion of the person. It works well, as do the other elements in the shot. Nicely done! Good story James, I always appreciate your stopping by and commenting. Great shot, John. Another one I missed. I agree about the discomfort with people shots but feel like it’s coming easier. I think Mark did best on our trip by engaging the people in conversation first so it wasn’t all about the photographer. BTW, finally got an RSS reader installed. Good idea. He had it down. His shot of the guy with the tatoo on his back was great. Now that I’ve got an RSS reader, I’ll be checking in more often. I have been uncomfortable photographing people too. In part, because I never felt I could do people justice, and in part because I didn’t want people messing up my “clean” landscape. I’ve come to realize though, that I will not grow as a photographer unless I leave my comfort zone and for me, that includes astrophotography and light painting scenes with people in them. And so in the future I think I will be less afraid to include people in my pictures. And by the way, great stuff John! Thanks Cynthia. ALWAYS love hearing from you. Ironic…a people person like you wary of capturing people in your shots. I think you have just found a whole new branch for yourself. I think the aged-woman adds dimension to the old car. I like it. You are a people person and have captured some amazing images, especially those with people in them. There is always a time and place for most everything. I know many that will wait-and-wait for the moment where there is no one in the image. Or, in post-process delete people from a scene. Pending on shooting a landscape or shooting within a city, including people adds scale and personality, especially capturing locals that essentially who are part of the city, are the personality of the city and essentially are part if the big picture. You photographed an image a while back where you mentioned that getting up early in the morning offered a clear image and without people in it. You commented that a few hours later, vendors would arrive, set up and people would come. Reading the words allowed to imagine what the people and scene woul look like., I wondered how more rewarding the image would be in capturing the true hustle and flow of the city and moment when there were people. Capturing what we see and feel. Capturing the moment. Seeing beyond what our expections are. Studying an image after it is taken and discover the treasure we did not see at the moment – such as the wife in the background that you did not see when you photographed the husband. Seeing beyond and within. Great image and topic JB! The woman with the cane adds a great element here! You are welcome John, and I might add that thinking back, I have taken photographs where I deliberately included people, though all of these were in Henry Coe. I took a photo of a scene once where 4 backpackers were headed out into the park for their backpacking trip and it turned out to be one of my favorite photos. I have taken other photos of people hiking in the park and those have turned out interesting to me as well as they added action to the landscape. In the end, I think it depends on the picture but now I am thinking more about how I can add people in rather than leave them out. For instance, would it be more interesting to have a shot of a blacksmith shop without the blacksmith? The blacksmith is an integral part of the shop so I think I would prefer to include him! Yes the person adds human interest, taking it out of being just another still life – which, while wonderful in its own way, makes this a different picture. I like it. And when you step outside of your comfort zone, to photograph people, you do a pretty dang good job, John! In most cases I would have waited till the woman had left the scene but without the woman it would have been another image of a parked car, not that there anything wrong with that ;-). She adds interest to the picture, my eyes switch from the car to the woman to the signs overhead. Nice capture, thanks for the lesson.